As we reach the midway point of the 2018 baseball season, it is time to take a look at where the Houston Astros prospects now fall. One big trade removed a couple of prospects as Colin Moran (preseason #5) and Jason Martin (Preseason #17) are now plying their trade in the Pittsburgh organization as part of the return for Gerrit Cole. A couple of lower ranked prospects were released (Troy Sieber, Sean Stutzman), and one (Jon Kemmer) was traded for cash considerations. That leads us to this iteration of the Top 50. In my preseason Astros Top 50 there were a few that I got right, a few that I got wrong, and more than a few that I missed. One thing that I am sure most fans can agree on is that the Astros won’t be rebuilding for a good, long while. Tucker earned the call after an impressive spring that continued in AAA. Will get an extended audition at the highest level. If everything goes well, could patrol the Minute Maid Park OF for the next decade plus. 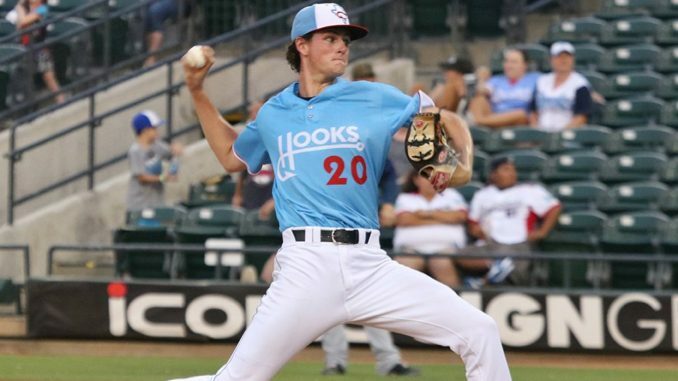 Whitley missed the first 50 games of the season after a suspension and started hot for the Corpus Christi Hooks. Has still pitched well considering he is 4 years below the average age in the Texas League. Spent a month on the DL (16 May to 16 June), but still turned in an impressive run in Corpus Christi. Alvarez earned a promotion to AAA and hasn’t found his groove yet at the highest level of minor league ball, but he is still just 21. After a rough introduction to AA in 2017, Perez has found his footing and, while he looks like a definite future rotation piece, Perez will work out of the bullpen in his first taste of big league action. After dominating Carolina League hitters to start the season, Martin has not skipped a beat since being promoted to Corpus Christi. The 2017 3rd round pick is making people sit up and take notice. Bukauskas has spent most of 2018 on the DL. Has failed to impress in his few outings this season, but should be able to turn the corner when fully healthy. Armenteros is picking up right where he left off last year. A combined 15-1 with a 2.86 ERA across 138.1 IP with 44 BB and 156 K at the minor’s highest level should allow him to see Houston in short order. 2018 1st round selection has done nothing but hit. 15 extra-base hits in 31 games with a 16.1% strikeout rate and a 11.2% walk rate. Might lack a true defensive position, but the bat will play. All Javier has done this season is strike people out. Has a plus slider that can make hitters look silly. Is being developed as a starter, but could end up in the back of the bullpen. Early season inconsistencies caused Perez to drop in the rankings. Missed most of the 1st half on the DL, but has started to shake off the rust. Great control (2.0 BB/9) has been his hallmark and that continues. Tommy John surgery cost Perez all of his 2017 draft season, but has looked worthy of a 2nd round pick so far. Has had an impressive season in Fresno. Could be a September call-up and will look to make the big league roster in 2019. Celestino is another in a long line of OF prospects patrolling the Houston farm. Doesn’t do any one thing outstanding, but does several things well. Since being reinstated after his suspension, Deetz hasn’t missed a beat. Still showing the floor of a back end rotation piece. Alcala has a fastball that can regularly hit triple digits. With a reduction in walks can continue to rise the rankings. One of the names I had tragically low in the preseason list. Needs to learn to walk more (1.3%), but doesn’t strikeout much (13.3%). Has the chance to stick at short and be a solid contributor. Had Solis ranked low in the preseason for no good reason. Pitched well in the Midwest League at 18. Needs to improve control, but the potential is there. Ferguson is an on-base machine (42 BB in 259 PA). Might need a change of scenery to ply his trade in the Majors. Sandoval has turned heads this season. Currently riding a 33 inning scoreless streak. Only 3 walks over his last 36 innings. Early season call-up, but has spent most of the season at AAA. Most likely to be depth at the ML level in the event of injury. Currently in the middle of a 16-inning scoreless streak. Matijevic has struck out 70 times in 243 at-bats, but has also hit 11 home runs, driven in 30, and stolen 10 bases. After a less than inspiring 2017, Matijevic has turned it on this year. Toro has really found himself in 2018. The power game is strong with this one (24 2B and 15 HR). One to keep an eye on moving forward. The 2014 34th rounder is climbing Astros prospects charts with an impressive display so far in 2018. After a less than impressive 2017 debut in full season ball, Blanco has impressed in both the Carolina and Texas Leagues. 2018 2nd round draft selection recently made his debut. Ranked here because HS arms have a notorious history of uncertainty. Could very easily climb this list in 2019. Holding his own in AA, but needs to cut down on strikeouts (26.5 K%). A repeat of high A has allowed Duarte to show vast improvement (.190/.250/.260 in 28 games in 2017). Signed out of Brazil in 2017, Tokar comes in at 6’6″ 256 lbs with a fastball that sits 88-92. One to watch for sure. After an outstanding 1st half, Sneed has been slow out of the gate in the 2nd half (12.15 ERA, 6.2 IP, 8 BB, 6 K). There was quite a bit of fluctuation toward the bottom of the list as we hit midseason. I think that just speaks to the power of the Astros’ farm system. There might not be as many high-ceiling players as there were a few years ago, but there is no doubt that there is still an abundance of quality players that will help the Houston stay in contention for many years to come. Not going to lie – I expected to see Toro and Josh James much higher! James has been one of the best pitchers in all of the minor leagues for the entire season. You may want to research a little more on Josh James. He is touching 99 mph tonight, with a plus slider. Even if he goes to the pen, he is certainly way higher than where you have him.